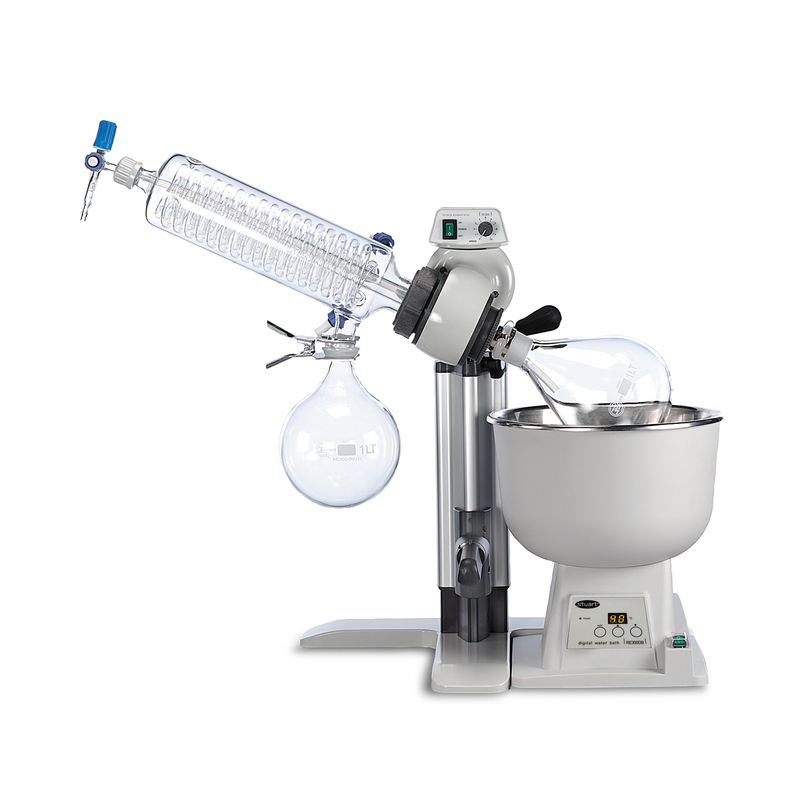 Rotary evaporators are distillation units that incorporate an efficient condenser with a rotary flask system. As the flask containing the solvent is rotated it continually transfers a thin layer of liquid over the entire inner surface. This gives a very large surface area for evaporation that is effected by heating from the accessory waterbath. The rotating system is fitted with a special seal that allows the apparatus to be placed under vacuum. This reduces the boiling point of the solvents and removes the vapour phase making the process much more efficient. Each unit is also provided with an easy to use vacuum release and a continuous feed system, which allows more solvent to be drawn into the rotating Florentine flask without the need to stop the operation. There are three patterns of condenser available depending on the application and space available. 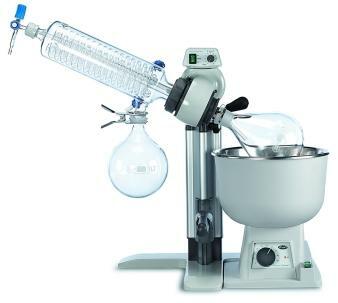 Rotary evaporator with diagonal glass condenser for standard distillations. Rotary evaporator with vertical glass condenser for distillation of solvents with higher boiling points. 20% narrower than RE300 saving space. Rotary evaporator with cold finger glass condenser for use with ice or dry ice for volatile or low boiling solvents. No cooling water required. Unique drain to empty the large 1 litre trap very easily. For each condenser pattern, there is also a plastic coating option for extra safety when using the glassware under vacuum. It acts as a safety screen, contains the glassware pieces and gives the operator sufficient time to transfer any potentially dangerous chemicals to a suitable vessel without spillage. For resellers, educational establishments or for larger projects, please contact us directly for pricing as you may be subject to possible discounts.